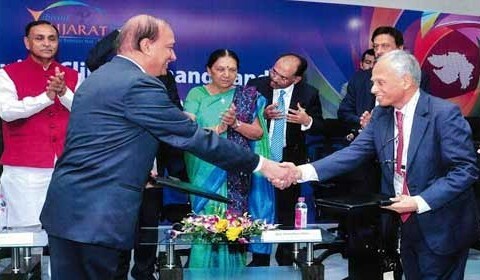 The vibrant Gujarat series of biennial summits was the brainchild of Narendra Modi, the former Chief Minister of Gujarat. Started in 2003, it was conceived as an event to bring investments to Gujarat and make the State the premier investment destination in India by showcasing its business-friendly environment. Modi’s record of running a clean state government and its economic performance and infrastructural development propelled him to the Prime Minister’s position in 2014 with a very large majority, a situation not witnessed in India for decades. His management record speaks for itself. Gujarat accounts for about 6% of the Indian land mass and around 5% of its population. However, its economic performance under Modi was stellar. The state now accounts for 7.6% the country’s GDP, about 10% of national employment and a whopping 22% of Indian exports. Under his leadership, between 2001 and 2012, the state averaged annual GDP growth of 10%, and almost consistently well above India’s GDP growth rates. When he took over in 1991, Gujarat was an electricity deficient state but it is now a power surplus state, with all its 18,000 villages electrified. Gujarat is located in a very arid climate which ensured the people suffered from serious water scarcity during non-monsoon months. Thanks to major development projects like the Sardar Sarovar and completion of a state-wide water grid, water scarcity has now become an event of the past. Not surprisingly, the Indian voters wanted the Modi magic to work over the entire country. This year’s Vibrant Gujarat effectively transformed itself from a state to a national event. Gone were the speeches by mostly Indian dignitaries praising the Gujarat model of development and soliciting investments for the state. It has now transformed itself into a national event with a truly national and international cast of important political and business leaders and heads of international organizations. For the first six Vibrant Gujarat Summits, Modi had invited the Indian Prime Ministers to inaugurate them but none had ever accepted his invitations. With Modi as the Prime Minister, it was a foregone conclusion that he would take a major part in the Summit. As the Prime Minister he gave it the necessary gravitas so that it could be transformed into a global event. World Bank President Jim Yong Kim noted the country needs “effective collaboration, which includes iconic projects like the Green Revolution, White Revolution, roads, bridges and rail network that will link this vast land” and measures to improve health conditions. Noting that some 500 million Indians still living in absolute poverty, he urged that during the next decade, India could be the leader to guide the world to end poverty. The new Vibrant Gujarat and its results can be gleaned by some of the statistics from the event. Overall, it attracted some 25,000 participants, about 10% coming from 110 countries. A total of 21,304 Memorandum of Understanding (MoU) were signed this year, by far the highest in its entire history. This compares to 17,719 in 2013. The Chief Minister announced that the total value of the MoUs was Rs 25 trillion. To put this figure into perspective, it is more than three times Gujarat’s 2013-14 GDP, and nearly one quarter of India’s current annual GDP. In addition, strategic partnerships with 1,225 organizations were signed. Like in all such events, intents of many private and public sector organizations do not get transformed into reality. However, even if 10% of the MoUs become reality, it would still mean increasing Gujarat’s GDP by about one-third, a no mean feat. The Chief Minister announced that a committee under the Chief Secretary will monitor the implementation and progress of the MoUs and she herself will head the committee to ensure there are no issues in terms of policies, regulations and other constraints for the implementation of the projects, and she will check progress every three months. As a scientist and policy advisor, one of the most attractive parts of the Vibrant Gujarat was the seven thematic seminars. I attended the one on water security, climate change and sustainable development. The organizer of this 4-hour seminar, Principal Secretary Rajiv Gupta, did an absolutely remarkable job in bringing together 10 of the world’s leading experts from academia (including a Nobel Laureate), heads of international organizations and captains of industries. It was truly excellent, and the presentations and discussions were not only at a high level but were also absorbing. The Hall was full all the time with 500+ participants. By all accounts, this seminar was an outstanding success. If in the future, Gujarat can organize about 6-10 such highly informative and productive seminars, the event will be worth attending for such seminars alone. A major problem India now faces is how to effectively utilize its 500 million strong work force which is increasing annually by 12 million new job-seekers. Sadly, bulk of this work force is of low skill or no skill. Nearly half work in the agricultural sector that contributes to only about 15% of GDP. Ensuring the country’s workers have decent jobs which would enable them to have reasonably good standard of living is of paramount importance for the country’s economic and social stability. Events like Vibrant Gujarat will go a long way towards achieving this national requirement. A major Indian problem is the constraint the businesses face to establish themselves, including innumerable red tapes, lack of basic infrastructure of all types, extensive corruption at most levels, absence of accountability and transparency, and the continuation of licence-raj which has become synonym for corruption. World Bank currently ranks India 142 out of 189 countries for “ease of doing business.” Modi wants India to be within the first 50 two short years. It is a worthy goal that will not be easy to achieve. Asit K. Biswas is Distinguished Visiting Professor, Lee Kuan Yew School of Public Policy, Singapore and co-founder of the Third World Centre for Water Management, Mexico.